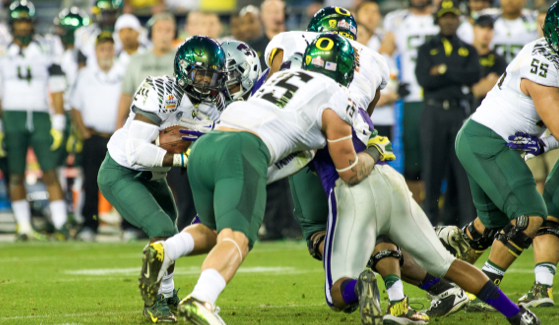 It is well established that the zone scheme, including the Inside Zone, Outside Zone and the Zone Read, is the key concept of Oregon’s Spread Offense. As such, there has been a great deal of attention paid to these schemes, including my previous article on developing offensive lineman for the zone. To complement the zone scheme, it is also important to install constraint plays that help keep the defense off-balance and provide the offense with a variety of ways to move the football on the ground. How this is implemented depends heavily on the formations used and the coach’s philosophy. In this article we will explore the trap concept and how it can be used to diversify the Spread Offense run game. When developing a running game in the spread offense, it’s important to include a variety of downhill plays that implement power concepts. One excellent way to do this is to install a Trap package that compliments the zone scheme. If done properly, this will cause problems for the defense and make reading the blocking scheme that more difficult. One of the most effective trap schemes is known as the “influence trap.” In the diagram below you can see how the play can be blocked from a 2×2 set with six defenders in the box. 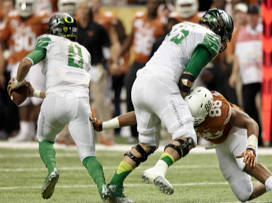 Mariota can cut inside the tackles and explode. The play can be called either as a predetermined give to the tailback, or it can use the read concept to add another wrinkle to the play and incorporate the QB as a running threat. The blocking scheme is simple, but very effective. The tackles will both take inside releases to the nearest inside backer and the center blocks down on the 2-technique defensive lineman. The back-side guard will pull, keeping himself tight to the center’s down block, and kick out the 3-technique. The play-side guard pulls tight off the tackle’s release and kicks out the defensive end. This is where the influence, or “false pull,” occurs and is very effective in accomplishing two desirable outcomes. Most importantly, this causes the 3-technique to widen, and in some cases turn his back, which often leads to a very large running lane. The second benefit is the false read it gives the play-side linebacker. Both of these benefits create hesitation in defensive reactions and improve the effectiveness of the offensive scheme. In the backfield, the QB takes the snap and steps with his back-side foot to the mesh point. If the call is for the tailback to get the ball, the QB makes the handoff and runs out his play fake. If the Trap Read is called, the QB will get his eyes to the back-side defensive end and make the read. If the DE comes down hard inside, the QB will keep the ball and attack the perimeter. Conversely, if the DE sits or keeps contain, the QB will hand the ball to the running back and run out his play fake. In either case, the running back takes a 45-degree step and gets downhill. He reads the play-side linebacker and attacks the hole tight to the guard’s kick-out block on the 3-technique. On the perimeter, receivers block the most dangerous man depending on the defensive alignment and offensive game plan. Another common trap play for spread teams is the QB Trap. Below we see how the play can be blocked from 3×1 set against a 6-man box. In this play, the offense is trapping the 5-technique and the QB is the ball carrier. Once again, the blocking scheme is simple and effectively compliments the zone concept. The play-side tackle releases to the near backer and the play-side guard base-blocks the 2-technique, while the center pulls and kicks out the defensive end. On the backside, the guard and tackle use their zone rules for the 3-technique and the back-side linebacker. 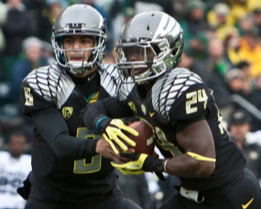 Marcus meshes with Barner in 2012. In the backfield, the QB takes the snap, flash fakes to the running back and reads the play-side linebacker, while attacking the hole tight to the center’s kick out block on the DE. The running back takes the 45-degree step and makes a play fake before continuing on to wall off the back-side defensive end. Once again, the perimeter blocks the most dangerous defender or the man covering him depending on alignment and game plan. The trap series is a great way to add some quick hitting, downhill plays to the spread offense and helps to make the zone blocking schemes more effective. Offensively, it is always important to implement plays that work together and set each other up to put various stresses on the defense. Additionally, the trap series should also have a complimentary play-action pass attached to it to further its effectiveness in the game plan. If you have any questions or comments, please use the comment section below and I will do my best to reply. Additionally, if you would like to discuss any of the topics here in greater detail, please feel free to contact me at optionfootball [at] optionfootball.net or connect with me on Twitter – @OptionFootball. You can also read more about the spread offense and other football topics on my coaching site.